And they milk that for all it’s worth. They have “private” conversations with each other on Twitter. They post pictures of each other on Instagram. They have entire Buzzfeed lists dedicated to their friendship and mutual adoration (like “35 Times Mindy Kaling And B.J. Novak’s Best Friendship Killed You In The Heart”). Comics (Mindy included) are big believers in the funny memoir. Tina Fey’s Bossypants was a big hit, Chelsea Handler just came out with another one (Uganda Be Kidding Me ), and, bizarre though it may be, even Kathy Griffin manages to write best-sellers (like Official Book Club Selection ). But, even though B.J. is following in Mindy’s book-writing footsteps, he decided to forge his own path. One More Thing is not a memoir; it is a collection of fictional short stories. The stories range in length from two sentences to twenty-three pages. They’re a compilation of little riffs and jokes B.J. probably thought of while brushing his teeth or sitting in traffic or filing his nails (Yes, in my mind B.J. Novak files his nails. I don’t think that’s too far a stretch). Perhaps they’re jokes he thought would be better on paper than delivered on stage or screen. But there are definite similarities to stand-up—like recurring characters (Remember Arush in “’Rithmetic”? He makes a cameo again in “A Good Problem to Have.” It all comes full circle). The two children began a game of war. This is a good idea, thought both children. Soon, I will win. Then the game will be over; I will be happy, and we can both go do other things. But no matter how many times they played war, they always forgot how tedious, how tiresome, how emotionally debilitating the game was; and how they always regretted having started the contest well before the time it was over. In that way, it wasn’t too unlike the game of bridge. The meat of the book is in the better, longer stories, like “Kellogg’s (or: The Last Wholesome Fantasy of the Middle School Boy)” and “One of These Days, We Have to Do Something About Willie” and “J. C. Audetat, Translator of Don Quixote” (see below for summaries). They are creative and smart and funny. The book as a whole would have been better if Novak had spent some time developing some of the super-shorties into longer-shorties. Note: Many of the stories have titles that tell you precisely what the story is about (like “The Comedy Central Roast of Nelson Mandela” or “The Man Who Posted Pictures of Everything He Ate”). Where further elucidation is not necessary, I have made that clear. Another note: There are a ton of stories here, so I put little asterisks in front of my favorites, in case you don’t want to read all of the synopses and would rather just read about the good ones. At the end, there’s also a page of discussion questions. They’re not meant to be taken seriously, of course. And, like the random discussion questions that follow stories like “Julie and the Warlord” and “Pick a Lane,” they’re not as funny as intended. They don’t detract too much, but the book would have been better without them. Who should read it: Jake (i.e., fans of The Office and comedy in general). This entry was posted in Rating: 3.5/5 and tagged B.J. 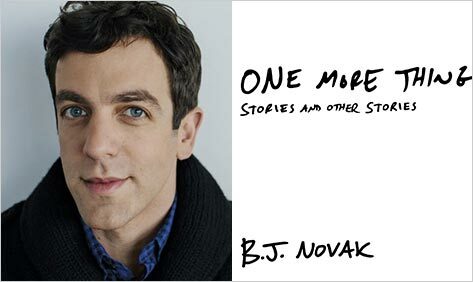 Novak, Book review, Book Reviews, Books, One More Thing, Short stories. Bookmark the permalink.